The Johnston Police Department responded to an armed robbery at Monks Corner around 5:45 Sunday evening, Nov. 22. According to Police Chief Lamaz Robinson, who spoke to The Advertiser shortly after the incident, a white female entered the gas station and presented the cashier with a note stating that she had a gun and would “blow her head off” if the cashier did not give her the money from the register. The suspect then reached over the counter, grabbed money from the register, and fled the scene. 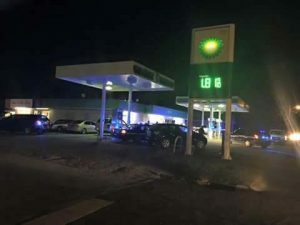 The suspect fled toward Saluda County, but Chief Robinson said “thanks to the swift action” of his officers, the woman was stopped by law enforcement at a church in Saluda County shortly after the incident. She was arrested at the church and transported to the Edgefield County Detention Center. The stolen money was recovered although an exact amount of how much the suspect stole from the store had not yet been determined at the time of Robinson’s statement to The Advertiser. Additionally, the suspect’s vehicle as well as possible illegal drugs and drug paraphernalia were recovered at the time of the suspect‘s arrest. Audrey Williams has been arrested for this armed robbery. She is expected to be charged “first thing in the morning” according to Chief Robinson with armed robbery, possession of a weapon during the commission of a violent crime, and failure to stop for blue lights. Depending on tests on the possible drugs items confiscated at the time of her arrest, Williams may also face drug charges. Chief Robinson was very complimentary of his officers in regards to the arrest in this case saying their swift actions “made all the difference” in the speedy capture of the suspect. The JPD is continuing to investigate this crime.